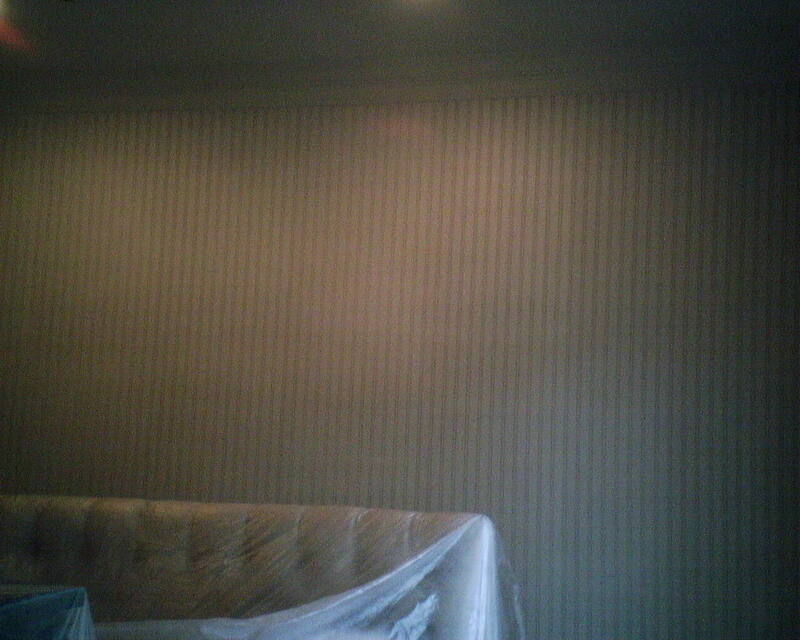 This is the second time this month that I’ve hung wallpaper that mimics beaded board paneling. Much cheaper than the real thing, and simpler to install, too. This paper is textured, meaning it’s three-dimensional, and is meant to be painted. Once it’s dry, it will be all white. the puffy vinyl surface did mar easily, so you have to be careful to not knock anything against it. The manufacturer is Brewster. It’s pre-pasted, easy to work with, and inexpensive. A great alternative to breaking out the power tools and nails and wrestling with the real thing. 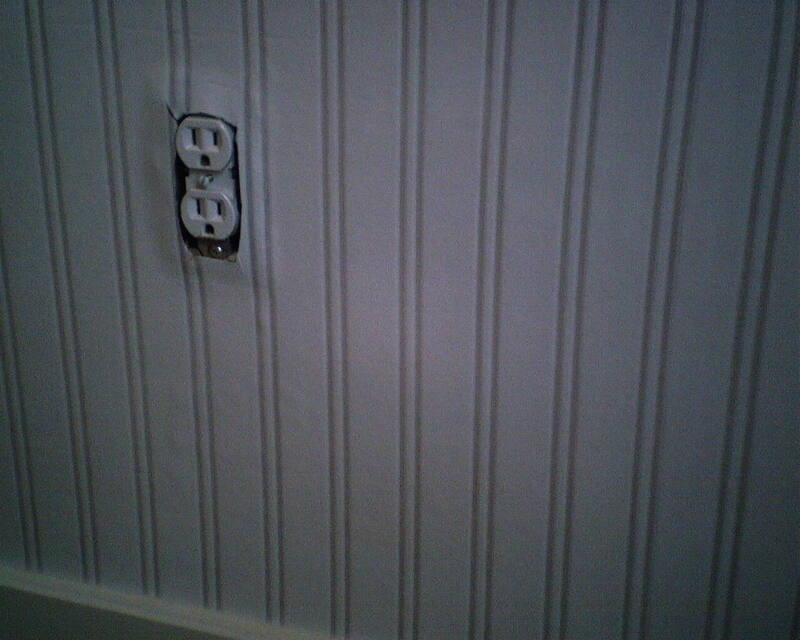 Note: Once the painters are done, they will replace the outlet cover. Hurry, there’s still a little time to see this exhibit, at the Houston Museum of Fine Arts. There were just a few specimens on display, but they spanned several centuries of wallpaper, from the 1700’s up to today – including a “digital” display that is a fancy word for what I would call a “movie” – projecting onto a wall changing backgrounds with slight movement from time to time. 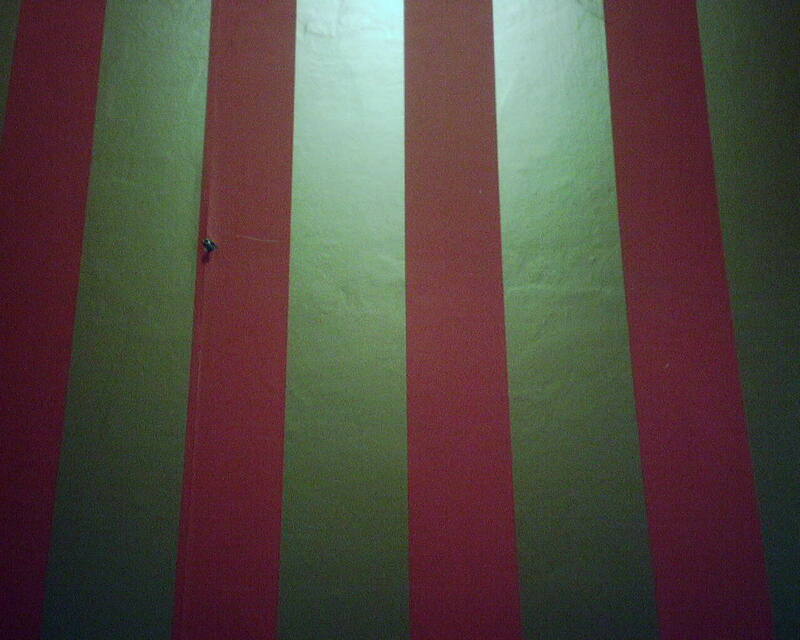 The homeowner and her daughter hung this 4″ gold-and-red striped wallpaper in a powder room. While they didn’t do a bad job, they weren’t happy with how it turned out. (See first three photos.) There were a lot of irregularities in the wall that telegraphed through the paper, some of the seams were curling, and some of the paper was coming loose. They hired me to rehang the paper. I stripped the paper, then skim-floated and sanded the walls to smooth them, and followed up with a primer. 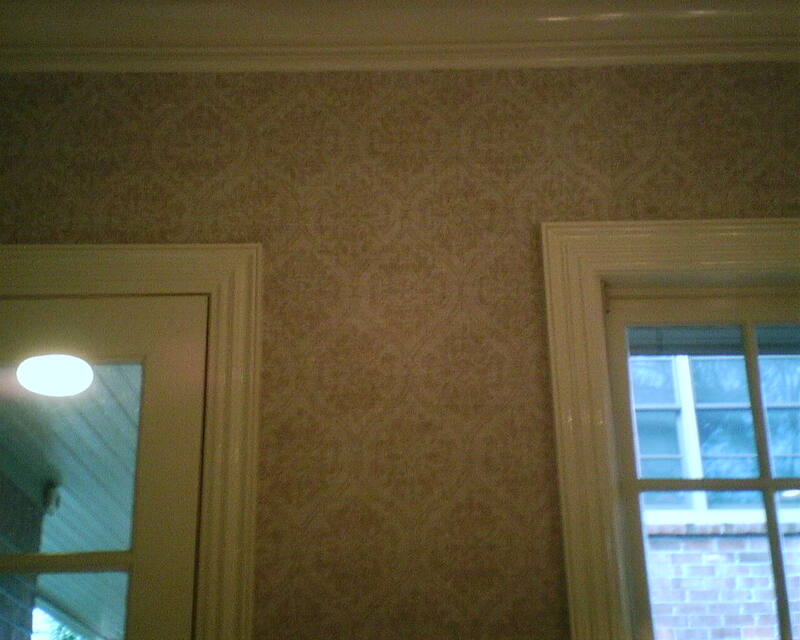 The wallpaper was pre-pasted, but I augmented that with a thin layer of paste rolled on the wall and cut in at the edges, to ensure that the seams stayed down. In the fourth photo, above a window, you can see how much nicer the paper looks with a smooth surface beneath it. Metallic papers are particularly prone to showing every thing that’s under them, so starting with a smooth surface is important. I also caulked around the top of the sink, so that splashing water won’t be wicked up under the paper, which can cause it to curl. This wallpaper is by designer Shand Kydd. 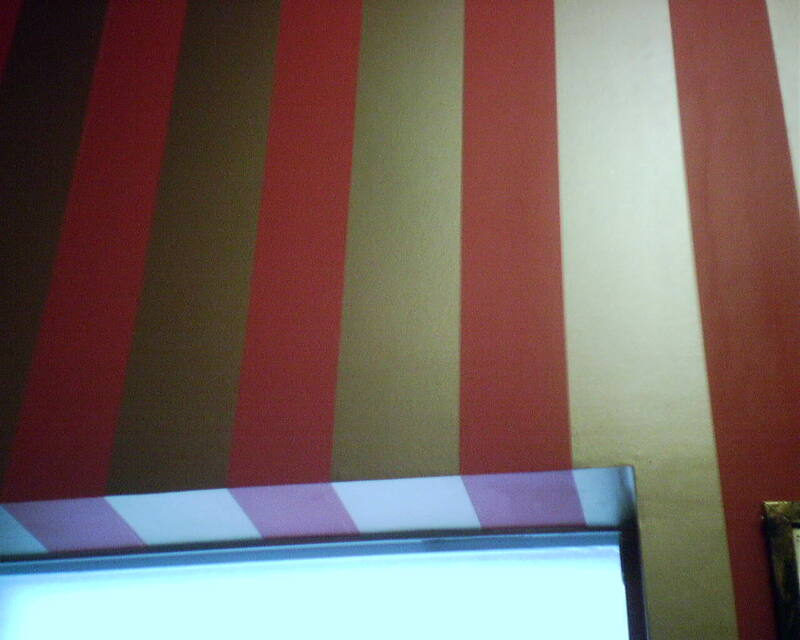 I have hung this wallpaper before, in a different color (tan), with no problems. This time, there were a number of issues. I found smeared ink on the back (not pictured), black smudges on the back and on the edges, and marks on the front that would not wipe off. 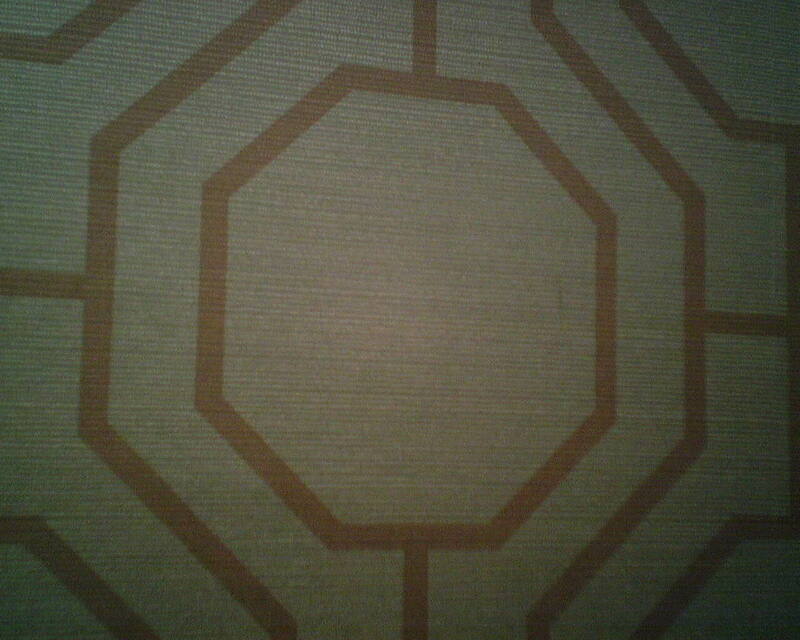 They are hard to see, but in the 2nd photo, the vertical mark is just inside the octagon, on the far right. In the 3rd photo, the vertical mark is just to the left of center of the octagon. I also had a whole double roll that looked like it had gotten wet at the factory, because a little adhesive was visible along the entirety of one side of the roll of paper. 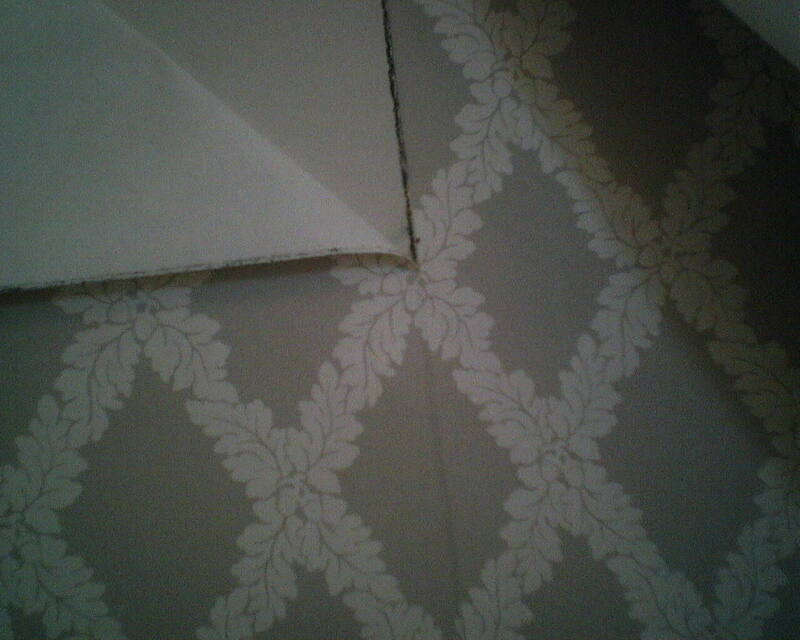 This wallpaper was put up by another installer. 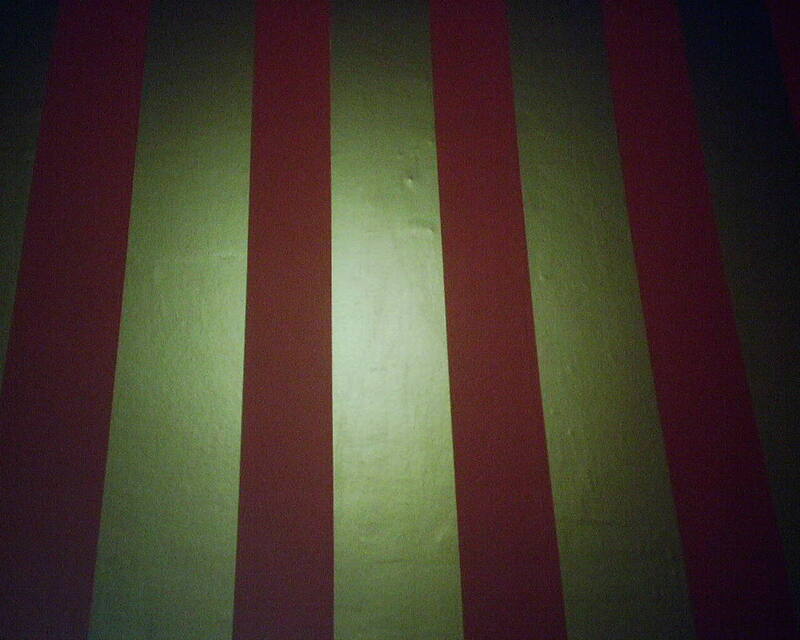 In the bottom half of the photo, you see a dark line at the seam. At first, I thought this was “staining,” an unpredictable phenomenon that happens with some pastes soak partly through some papers, and create what look like wet areas. But when I started to strip off the paper, as you see in the upper left of the photo, it was clear that what was showing through was the other installer’s pencil marks and plumb line. 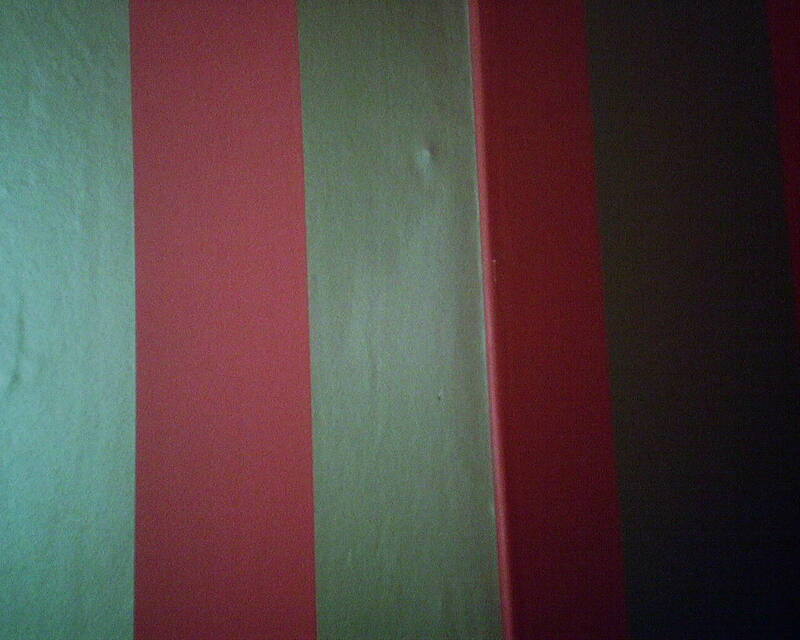 I write on the walls and draw plumb lines in pencil, too, and also mark on the back of the wallpaper. This is a good reminder to always write lightly, especially if the paper is thin or light colored. Note that, even if marks show through the paper when it’s wet, usually once it’s dried, the marks do not show. The previous installer was not so lucky. After I stripped off the paper, I rolled on a white primer, which both hid his lines and better prepared the surface for wallpaper. This pattern is by Sanitas, and is a pre-pasted, non-woven, breathable, easy to remove material. 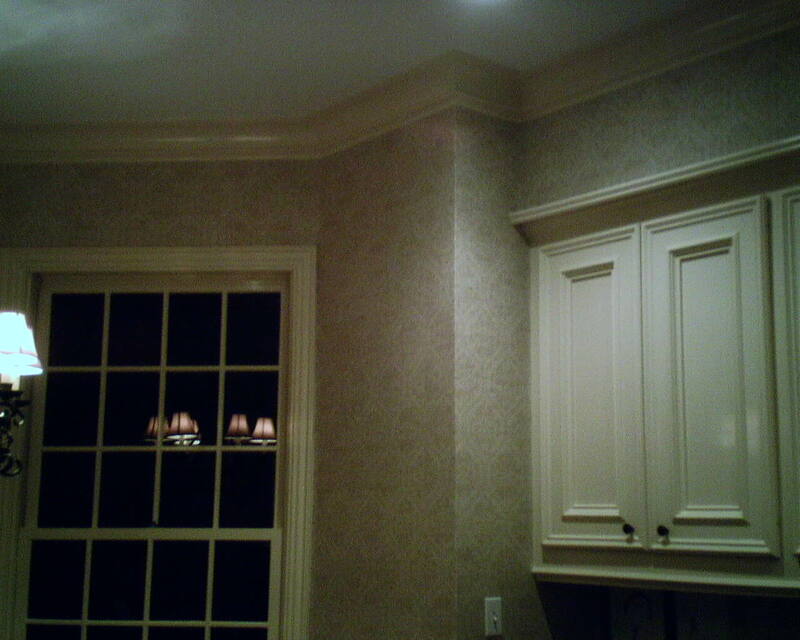 Adding to my previous post … another home had wallpaper in the powder room. It was a woven grasscloth with a damask pattern printed on it. 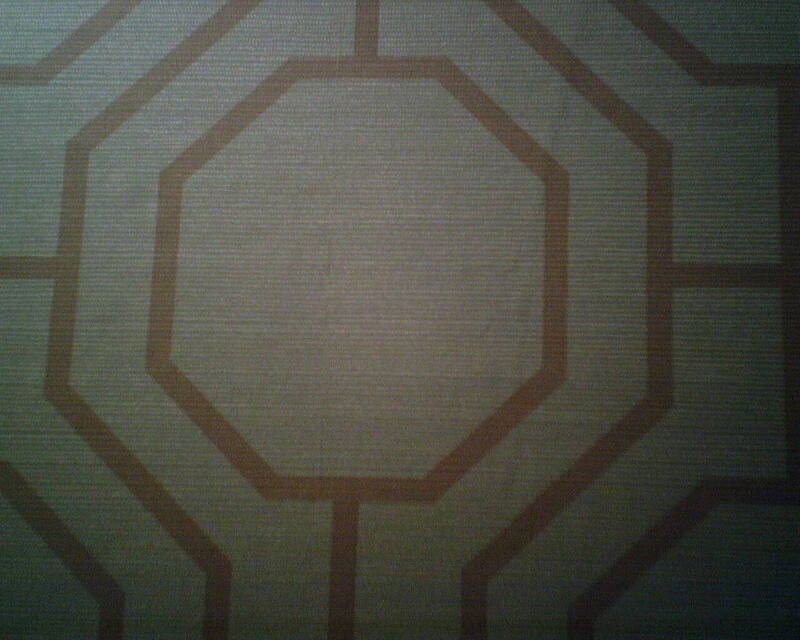 Because of the paneling / shading effect of grasscloth, and because we were not allowed to go into the powder room to get a close look, it was hard to tell if the pattern was all over the paper, or just in blocks here and there. Either way, it was an interesting look. The same paper was also hung on the ceilings. 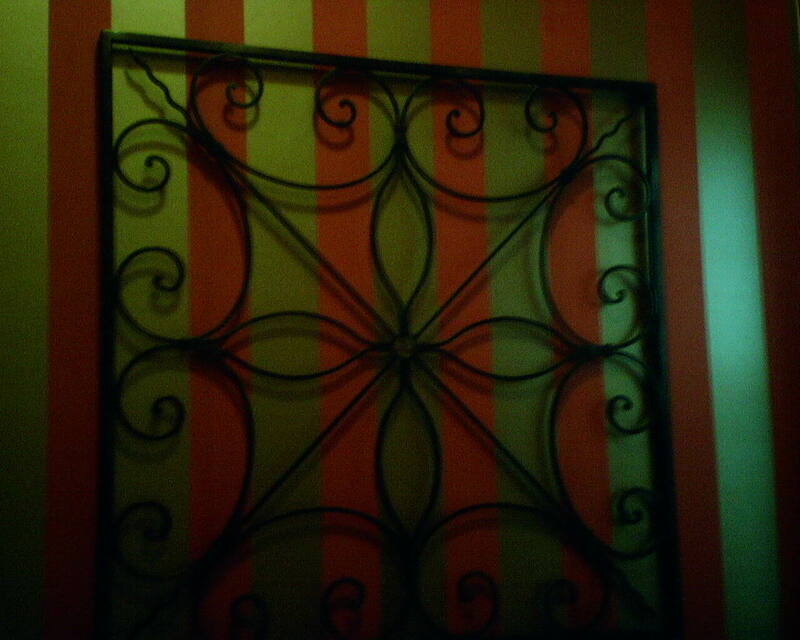 I’ve posted before, I’m not a fan of wallpaper on the ceiling, especially a darkish color like this one. 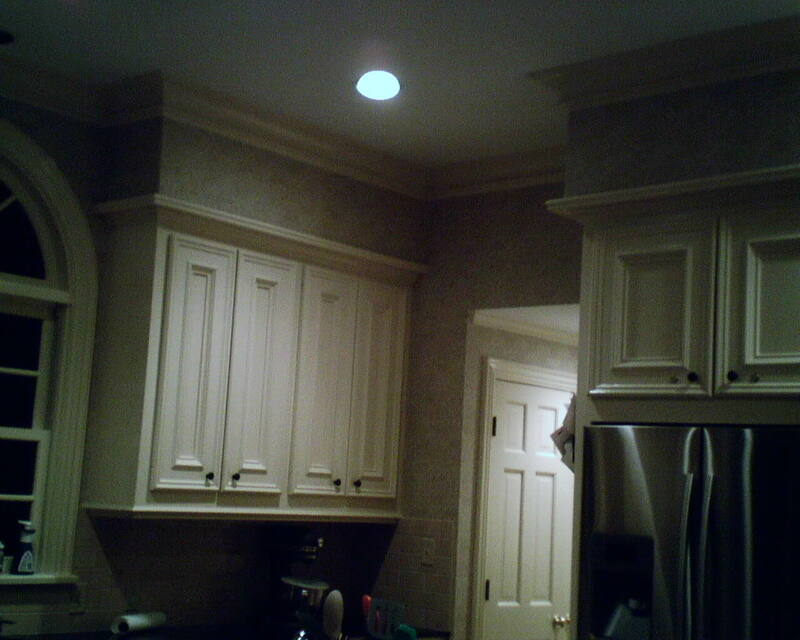 To me, it crunches the ceiling down and makes the space claustrophobic. I spent a day and a half on prep – stripping the old paper, fixing little spots, and priming. 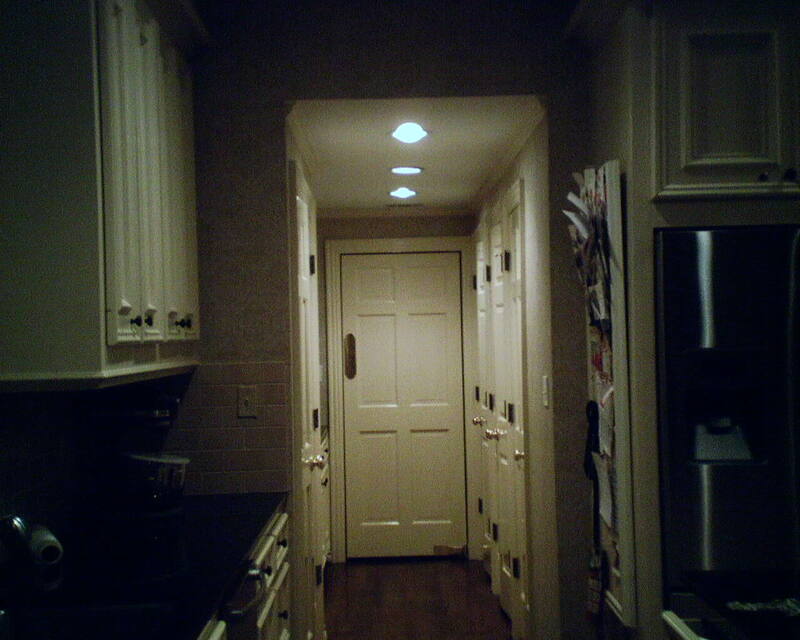 Then a full 18 hours hanging the 14 rolls in this very cut-up kitchen and butler’s pantry near West University Place. There were tons of nooks and crannies, windows, doors, and oddball spaces. 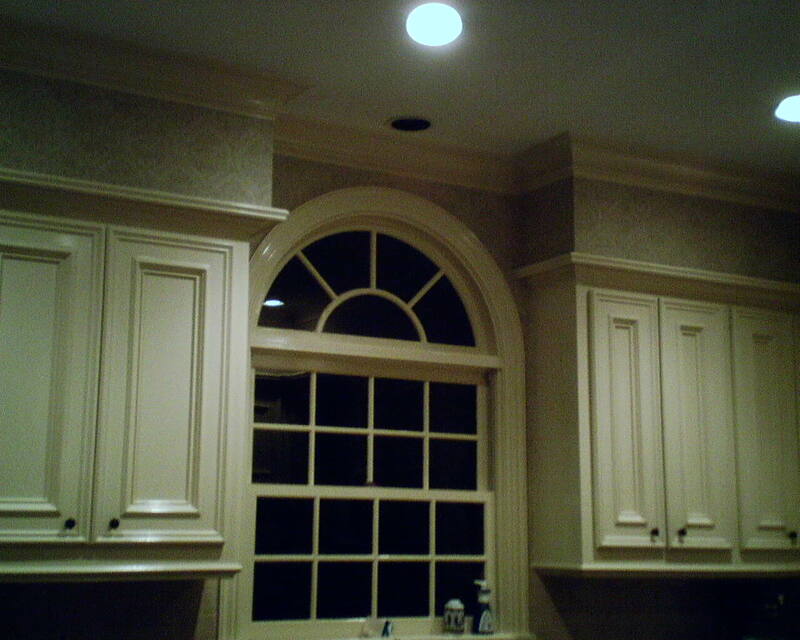 And every time I turned around, there was a piece of decorative molding with complicated edges to trim around. 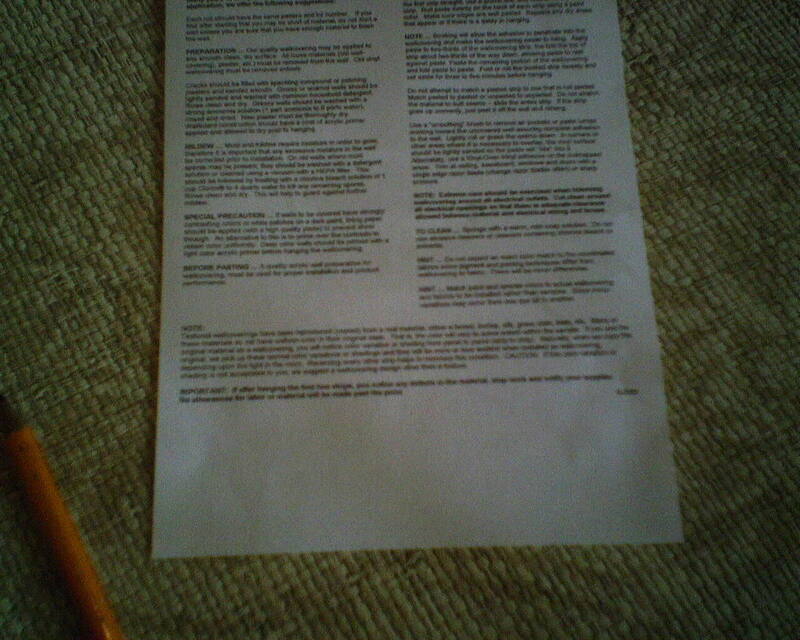 Plus, the paper was thick and cantankerous, hard to cut, hard to fit into place, and really hard to get it to turn an outside corner. In the end, though, it looks great. The color compliments the woodwork beautifully, and the pattern is sophisticated but subtle, and will be a good backdrop in a room where there is a lot of other activity going on – like a busy family life! This wallpaper is textured solid vinyl on a non-woven backing, a damask pattern imposed on a faux woven grasscloth material. 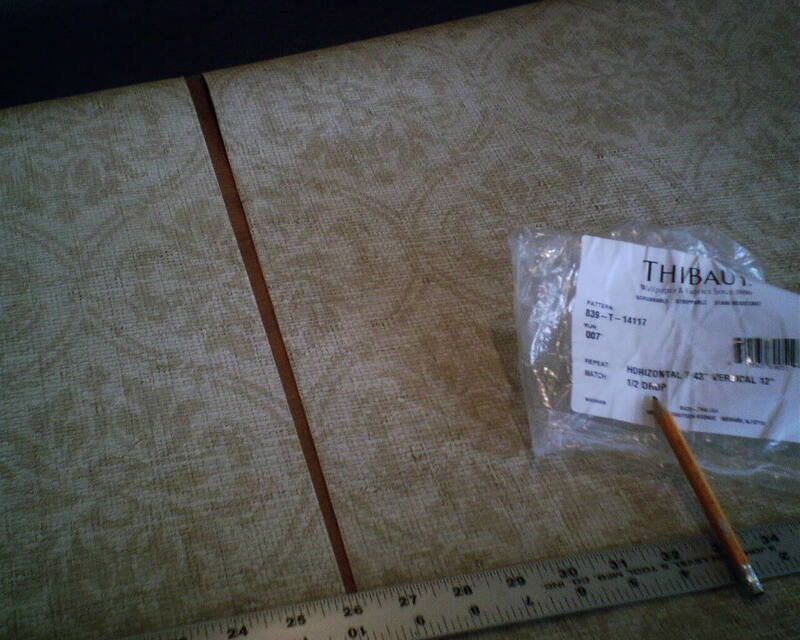 It is by Thibaut Designs, # 839-T-14117. “Textured wallcoverings have been reproduced (copied) from real material, either a tweed, burlap, silk, grass cloth, linen, etc. Many of these materials do not have uniform color in their original state. That is, the color will vary to some extent within the sample. If you use the original material as a wallcovering, you will notice color variation or shading from panel to panel (strip to strip). 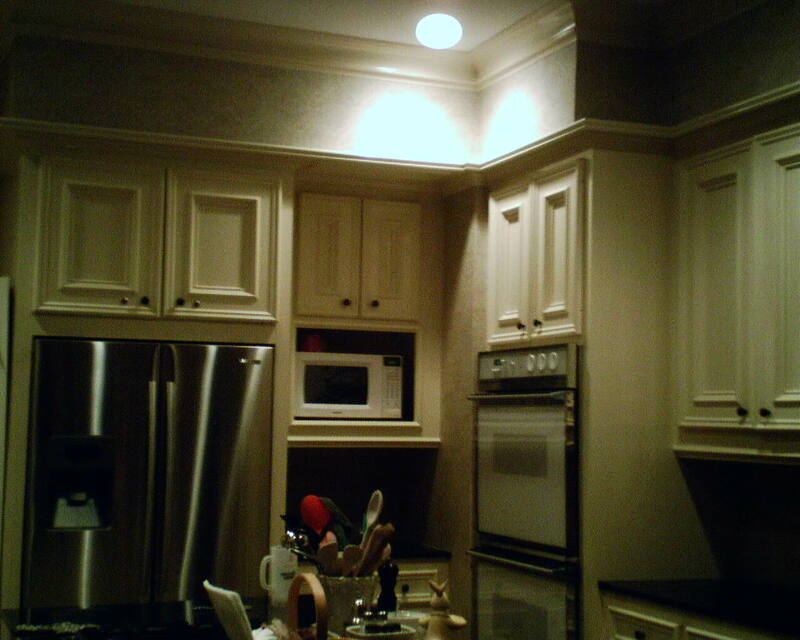 Naturally, when we copy the original, we pick up these normal color variations or shadings, and they will be more or less evident when installed as wallcovering, depending on the light in the room. Reversing every other strip helps to minimize this. I am thrilled with their Texture Resource Vol. 4 book, and think their fauxes are a positive alternative to the real grass products. The Texture Resource Vol. 4 products I have hung so far have all been fabric-backed, and have been pretty free of shading or paneling. I’m thinking that this disclaimer is inserted with other materials – the one I am working with this week, that had the disclaimer in it, is a paper-backed vinyl, not fabric-backed. Indeed, hanging the current week’s paper, there is a little shading from left to right. Not bad, but still – you’d think that when they are printing and coloring their own material, they could keep color differences to a minimum. Claiming that it’s OK because it’s copied from the natural stuff is a copout. I they manufacture it, they can control the quality, including color. The reason I direct people to the faux products is to avoid the flaws of the real/natural stuff! Still, I like the faux better than the real stuff, because shading is minimal (see photos), and less chance of damage from water or cats’ claws. In the January 2014 issue of Southern Living Magazine, I was pleased to see one of the feature homes showcase several rooms with wallpaper. Oh, folks! Let me get up on my soapbox! This is a big issue with me, so much so that I often give my clients touch-and-feel samples of what to buy and what to not buy. While it’s correct that splashes of water will run right off a solid vinyl wallpaper, if that wallcovering has a paper backing, as most do, humidity can be the death of it. Based on what I have seen in homes over the last two decades, I always advise AGAINST paper-backed vinyl in humid rooms like laundries or bathrooms. 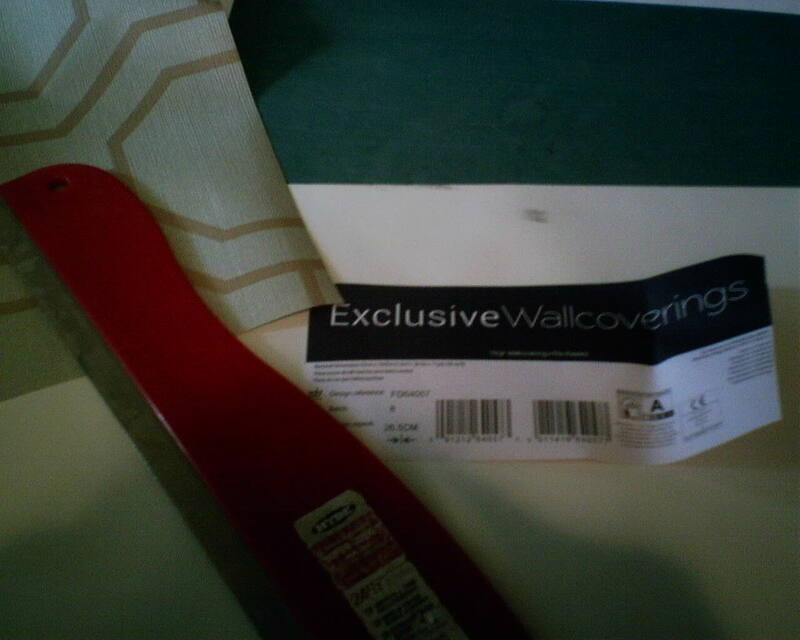 The reason is that the paper backing will absorb humidity from the air. The paper backing swells; the vinyl surface does not. So the paper stretches and the vinyl can’t, so it curls. As time goes on, the vinyl might even delaminate (detach) from the paper backing. You end up with seams that curl forward and leave gaps at the wall. These are not loose seams, and cannot be pasted back down. Now, there are ways to deal with this – In most of the rooms I have seen, the previous installer did not use a primer before hanging the paper. And proper ventilation of the room is a must. In addition, these days, there are options of woven fabric-backed solid vinyl papers, and also the new non-woven materials, both of which hold up to humidity better than the old paper backings. If in doubt, ask me. Five gallon buckets of wallpaper paste (or anything else, for that matter) are heavy, and it involves quite a wrestling match to remove the sealed lid. There are all kinds of gadgets to make that easier. 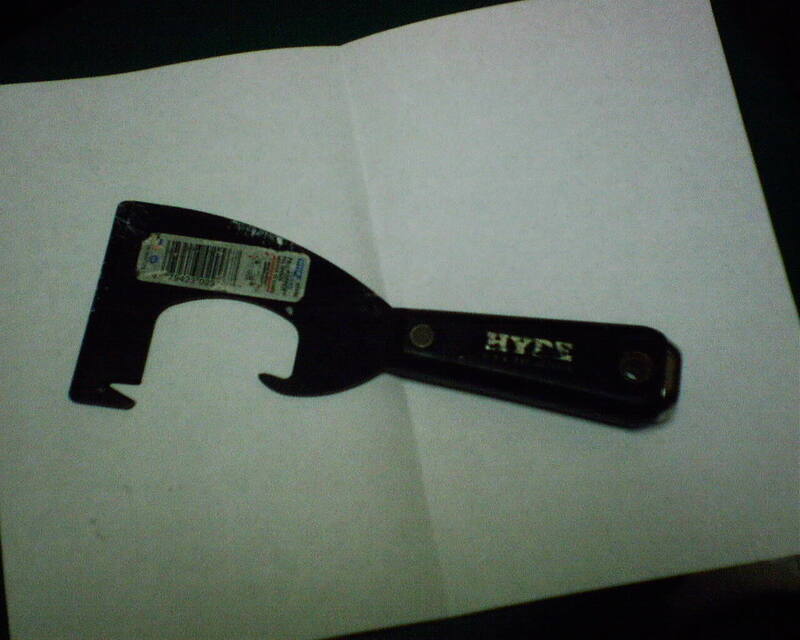 Some are large, heavy, and look like lug wrenches. Here is a pic of the one I use. I like it a lot. The “V” notch at the tip is for cutting the plastic band that locks the lid to the bucket, and the weirdly angled part is used to pry the lid off the bucket. This tool is pretty priceless to me. Years ago, it was given to me free by a former manager of the Sherwin-Williams where I shop most, on University in the Rice Village. You are currently browsing the Wallpaperlady's Blog blog archives for March, 2014.